Awfully nice of the club not to charge... EDIT: according to the site it's on World, meaning there will be a charge. Lots of subscribers on here, I'm guessing. I'm gutted though because on my way to work and World doesn't work on Apple, especially not iPhone. Humble pie for a week or two and they could have watched this story wither and die. No matter what line of work you are in, if the boss gives you a telling off and you immediately turn round and act like you think you did nothing wrong and got off lightly, you will get a further bollocking. 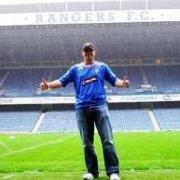 Rangers website will be showing the complete news conference. When you look at the midfielders we could be fielding, it's even more depressing to think all we can do is punt and hope Boyd gets a pop at it. You could cut and paste that comment into nearly every game he's played in the last two seasons. So disappointed he is there holding back Mendes. Mind you, Walter holds back the creativity pretty effectively too. Just woeful, the lads are showing no fire at all and Walter Smith's selections are awful, just awful. How can this be the team's reaction to an OF final? Wish we would get an official club statement, stead of being kept in the dark. that's what struck me when my father in law saw his first SPL game on TV the other week. Not that he thought the league was worse than the EPL but that he thought it was so completely awful. He couldn't believe the players were actually professional footballers. Reading the article, you'd think the final score was Aalborg 1 - Celtic 2. So, that's one point in the CL away from home out of home many? Is that the worst away record in the entire CL? Sadly, we didn't even get this far as the chairman and manager couldn't understand that a football team requires a midfield to work well. that is a fantastic deal. GBP25 for the meal alone is a good deal plus the speakers and a bit of culturally appropriate entertainment. I'd go myself if my taxi home wouldn't cost $1300. well said, Del. I wish everyone well tonight. just realised there is a signature request thread - can someone move this please? I would never stoop to booing a Rangers player just because I didn't want the club to sign him, though I could see booing someone who's conduct I thought was so bad it had embarassed the club. As for telling other fans they may not boo, its a very tough call. I hate to see us at each others throat in public, I hate to see our players getting less than 100% support. But if at the end of the day the only way to get through to a manager or chairman the concerns fans have about the team is by booing, their petitions etc having been ignored, then is it really all the fault of the fans? For the record, if we stick playing the same one man up front, no service from midfield, depend on the defence game that we did last year, I suspect Miller might do quite well.